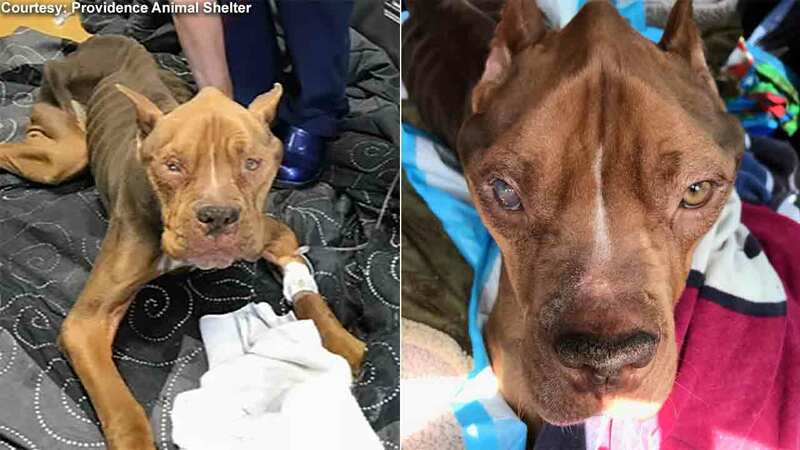 MEDIA, Pa. (WPVI) -- Sly, a large emaciated dog who was found in Delaware County last month, has passed away. "With incredible sadness, we must share the news that Sly has crossed the Rainbow Bridge. His expert team of caretakers at Penn made every effort to stabilize him, and in the end, his lungs just couldn't handle it. We're grateful he received one last kiss this afternoon from his beloved Dr. Croce. We're proud we could do absolutely everything possible to attempt to save him - all because of the support we received from you. We will forever be left with Sly's oversized footprints on our collective (currently broken) heart. We love you, big boy. It's been an honor." Investigators say a humane officer was called to Deshong Park in Chester around noon on Tuesday, April 24th, when a contractor noticed a dog in the park struggling to breathe. "It was right along 11th Street. He saw a dog on a blanket and he was a bag of bones and he couldn't lift his head," said Justina Calgiano with the Providence Animal Center. "He was kind of tucked in behind a tree and he had just been discarded there." It's one of the worst cases of emaciation officials say they've ever seen. He underwent emergency surgery where doctors found an intestinal blockage, what appears to be a rope chew toy. Humane officers are still gathering information, but say charges are likely. They do suspect Sly had recent medical treatment because of a shaved patch on his side. They also say one possibility is that Sly's owners found out that he needed expensive surgery and abandoned him. Shelter officials say in cases like this they can help. "The emergency surgery we did for Sly ... is something we do on a regular basis for families in the community that have received an astronomical quote from a private practice," said Calgiano.